and a 5-gallon bucket almost full of baby butternuts, carrots, and cucumbers. Baby butternuts and cukes on top of carrots. 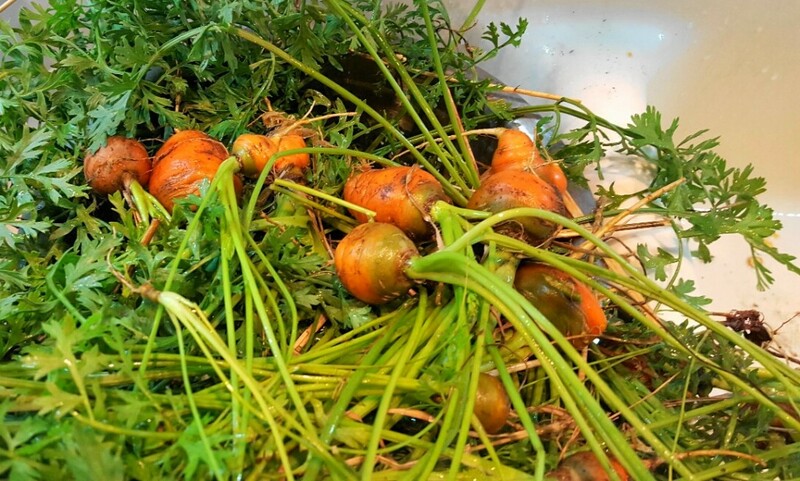 These are Parisian carrots…short little stubby things. 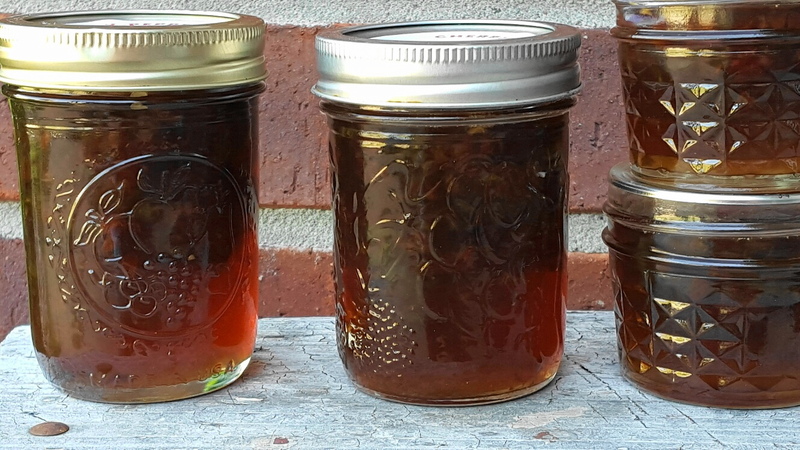 I have not made any jalapeno jelly this year so I decided I had enough time to make this quick and easy recipe. The following is based on my Apricot-Jalapeno Jelly. I didn’t have any dried fruit in the house but cherries and I thought, “What the heck. Might as well try it.” I had used cranberries before in this recipe, but they ended up floating to the top of the jars. This time around, I chopped the fruit with the peppers. The result was a beautifully colored jelly with a very unique (in a good way) taste. Place peppers, cherries and one cup of the vinegar in food processor and pulse until coarsely ground. Do not puree the mixture but leave some small chunks. Combine sugar, pureed mixture and remaining 1 cup of vinegar in a large kettle and bring to a boil, stirring often. Carefully watch because it can easily boil over. When it has reached a full boil, set timer for 5 minutes and stir constantly. Remove from heat. (You can skim off any foam at this time.) Let cool for two minutes. Whisk in pectin. Pour into sterilized jars and seal. Process for 10 minutes in a water bath. Makes about seven half-pint jars. Notes: For more heat, keep some of the jalapenos seeded. If you have a red bell pepper, it makes for a prettier jelly, but any bell pepper will work. 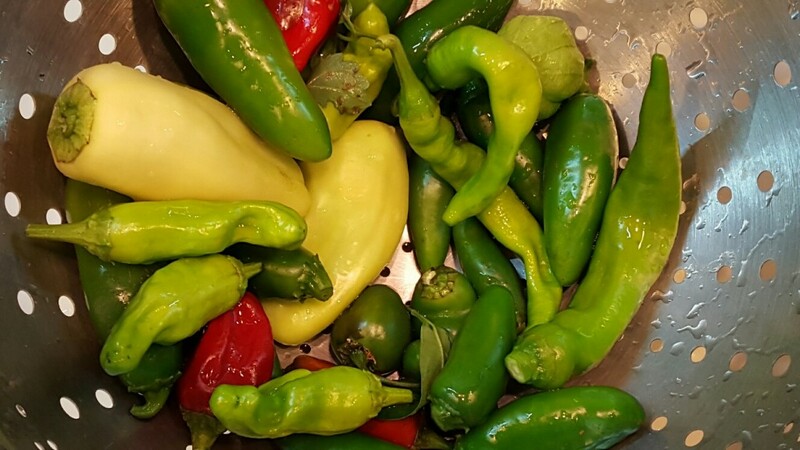 I have also used banana peppers and sweet Jimmy Nardello Peppers as well (or a combo of whatever is from the garden). Although this mixture looks small enough to fit in a large sauce pan, beware; it will easily boil over. Use a 8-qt. stock pan if you have it. I like to can this up using half-pint and quarter-pint jars. The smaller ones are great for holiday gifts. As stated before, I have used this recipe for a dried apricot version, a mango version, and I have also used dried pineapple. This most recent version, however, may be my favorite. P.S. 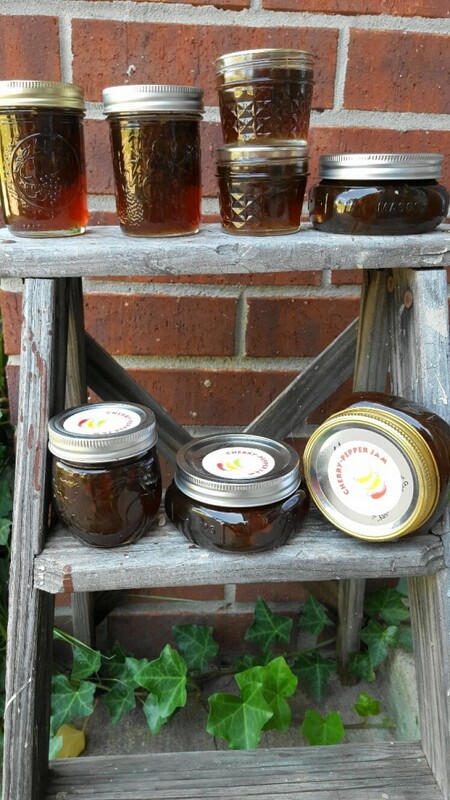 I just noticed that I labeled all of these “Cherry-Pepper Jam” instead of jelly. I also just realized that some might be confused that this jelly (or jam) is made out of cherry peppers. Again, I need to work on my recipe titling (and labeling)! 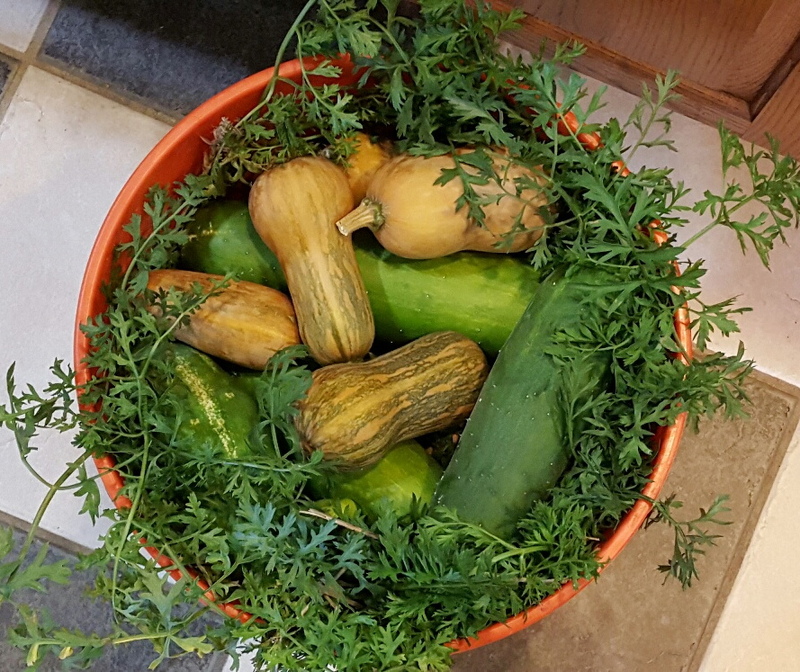 A wonderful harvest…those baby butternut squashes are beautiful. I wish I lived next door, so I could pop in and ask for some jelly to try on my protein bread! I love the idea of cherries with a bit of heat. Your jelly looks glorious. I’m also very jealous of your garden’s bounty (especially those cucumbers)! 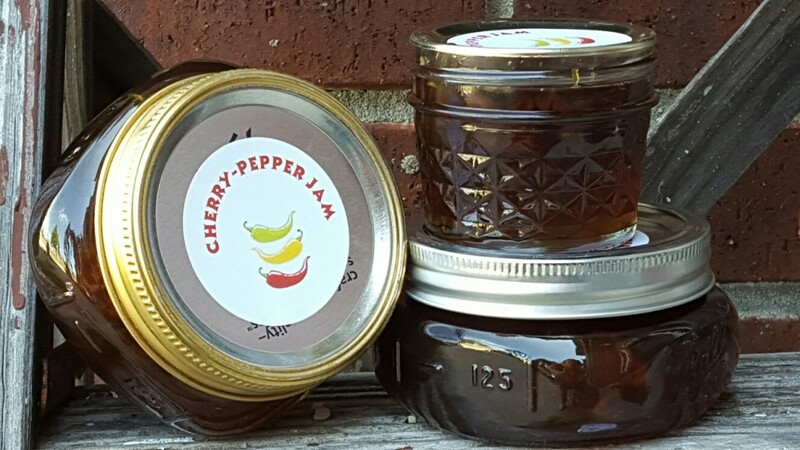 I think cherry pepper jelly sounds fantastic! And I love that photo on the ladder. I love this! Wouldn’t have though of using dried cherries. Parisian carrots? How fun!! Look at your “almost” autumn harvest! Impressive! And your jam is beautiful—it would be terrifice with cream cheese for an appetizer!